Neal Navani qualified in Medicine from Cambridge and UCL with distinction and several University prizes. He trained in Respiratory Medicine at the Brompton and Hammersmith Hospitals before winning a Medical Research Council Fellowship in 2008 and completing his PhD at UCL in 2011. He has also completed an MSc in Clinical Trials at the London School of Hygiene and Tropical Medicine. 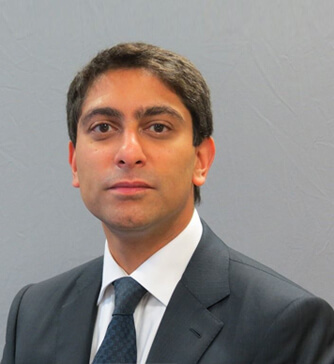 Dr Navani was appointed as a Consultant in Thoracic Medicine at University College London and runs the regional Bronchoscopy and Endobronchial Ultrasound (EBUS) service at UCLH. He is also clinical lead for the prestigious lung cancer service at UCLH. Dr Navani runs several clinical trials on the diagnosis and staging of lung disease and bronchoscopic techniques. He holds honorary positions at the Medical Research Council Clinical Trials Unit and University College London and is also a member of the UCLH early lung cancer detection and surveillance programme. His research is patient focused and aims to improve the patient experience and outcomes. Dr Navani has authored numerous peer-reviewed publications and is the co-author of a textbook on respiratory disorders. He is an invited member of a NICE technology assessment group, the British Thoracic Society guideline development group for bronchoscopy and is a peer reviewer for many journals including the BMJ, Thorax and AJRCCM.